I’m also launching a redesign of my website today, and even of this blog, ditching my old WordPress URL and finally getting a grown-up domain name of my own. You can still find me at this address, but it’s a little swankier over there. I’m really happy that my paperback is out in the world. (I always feel a little twinge about asking people to cough up money for a hardcover.) I’m delighted with my website, which was designed by the extraordinarily patient and good-humored Steffen Rasile of sra design studios. And I’m so pleased that my blog finally has a permanent home. One of the best things I’ve learned from Gretchen is to “grab those moments of happiness as they wing by.” So here I am, grabbing the moment. 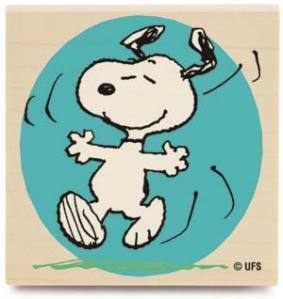 And doing a little happy dance. 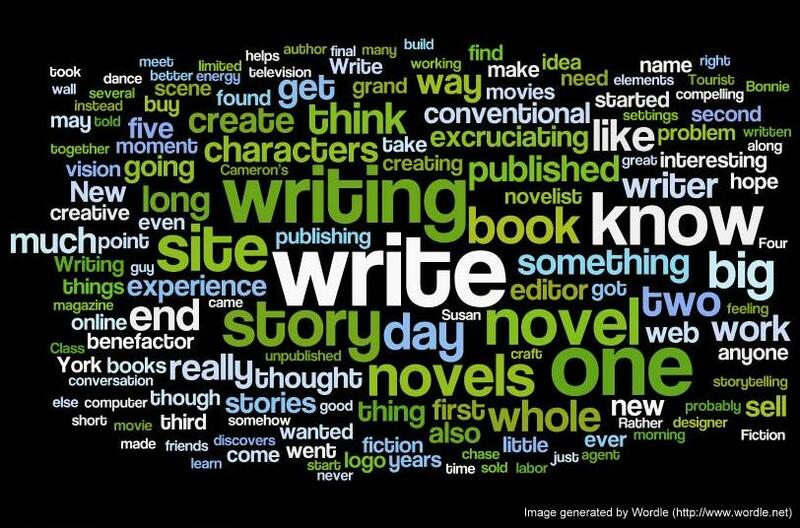 The most-used words on my site, courtesy of Wordle.net. When I began this blog, ten months ago, I had recently finished a novel that was several months from publication, Bird in Hand, and was beginning a new one (working title Orphan Train). I envisioned this site as a place to talk about the writing life and the process of writing my new novel-in-progress. I thought it might be a useful tool for the graduate students I teach and advise at Fordham, students embarking on creative-writing M.A. theses (mostly novels-in-progress) — a place to put in writing the ephemeral thoughts I articulate in class. But as more people discovered the blog, its nature changed. I began writing posts in response to readers’ queries and ideas, and found that I enjoyed talking more broadly about craft and the creative process. (The title and subtitle changed several times, reflecting my evolving shift in focus.) After a while the site attracted published fiction and nonfiction writers eager to contribute their own tips, tricks, and advice on different aspects of the writing life. I also started approaching authors whose work I admired. These guest posts expanded the scope of my project, delighting and surprising me with creative approaches to common problems and perceptive responses to metaphysical questions. I’ve been learning as I go, and recently I stopped to take a critical look at where the blog is now. From its modest beginnings last June, the site now gets a still-modest-but-respectable average of 2,000 visitors a week, has 300 subscribers, and has attracted over 50,000 views. Each new post gets 500-600 unique views. The blog has become a place for writers to share their struggles and advice about writing with one another. It provides a community for writers at all levels, from people who’ve never published a word to authors with dozens of books. Thanks to feedback from readers, I’ve made some changes to the site. With the help of the marvelous Jessica Wode, I created a Resources for Writers tab with links to other sites that I’ve found especially useful. (I’ll be adding to and, I suspect, whittling this list — suggestions welcome.) I’ve also updated and expanded the About tab to give new readers a better introduction to the site. I cleaned up the sidebar to help you more quickly and easily find what you’re looking for. You’ll find a new section, “Tips for Getting Started,” with links to posts with specific advice about launching your next (or first!) big writing project. And finally, you now have a one-click shop at the bottom of each post to share it on Facebook, Twitter, Digg, StumbleUpon, or several other sites. You can also become a *fan* (though that word makes me cringe) of my brand-new Facebook page to have blog posts show up in your newsfeed. And in about a month I’ll launch a newly designed, easy-to-navigate website — and this site will have its own domain name (dropping the “wordpress” in the URL), which will enable me to do even more with it. I hope these changes make the site easier and more enjoyable to navigate. I’d love to hear what you think. And try out the new Share tools! I don’t know how to use them myself, but I’m pretty sure my 15-year-old can teach me. This novel-– which, like Bird in Hand, is about the accidental death of a child that sets in motion a series of events that changes the lives of the main characters-– had a huge impact on me. My own opening paragraph, I later realized, echoes the beginning of Hamilton’s powerful book. 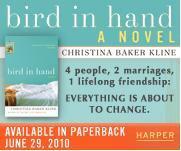 Bird in Hand is about four people, two of whom betray their spouses. I was interested in writing about moral ambiguity, which McDermott so brilliantly parses in this novel. If you truly believe that your spouse is not your soulmate, and that your own happiness is vitally important, what do you do? That people’s deepest feelings cannot be constrained by social norms or boundaries is an idea I wanted to explore in this book (and an idea that preoccupied Lawrence). Though two of my characters disrupt – and arguably destroy – other lives in their quest to be together, they are oblivious to all but their own happiness. My four characters are constantly at odds. Their preoccupations, passions, and dreams are often in conflict. In developing this story, I wanted to give equal weight to each perspective. I was fascinated by the complexity of The Good Soldier, and at how skillfully Ford got to the core of his characters’ motivations. This piece, in a slightly different form, originally appeared in Madame Mayo. William Faulkner used to map his stories on his office wall. 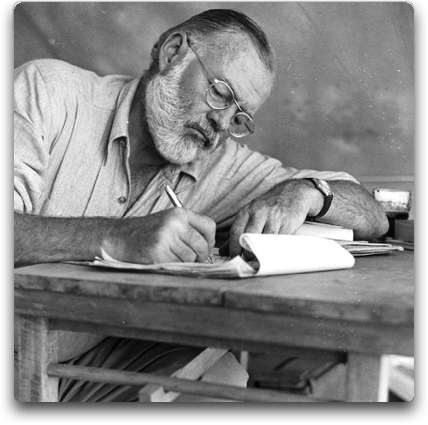 If you visit his home in Oxford, Mississippi, you can still see the notes for his novel in his precise, small handwriting. When Laura Schenone was writing her memoir, The Lost Ravioli Recipes of Hoboken, she kept photos of her Genovese great grandmother, Adalgisa, propped on her desk, and Adalgisa’s handmade rolling pin nearby. Edwidge Dandicat has an evolving bulletin board in her workspace where she tacks up collages of photos of Haiti and images from magazines. For many writers, visual and tactile stimulation is an important component of the creative process. I, too, have a bulletin board covered with images that change with each book I write. Recently I retired a tattered newspaper clipping that had been tacked to the wall in my office for eight years — except for the times I brought it with me to writers’ colonies or on family vacations (under the delusion that I might actually get work done on a beach). The image floored me. I had begun writing about a young couple, Ben and Claire, both expatriates living in England, who befriend another American named Charlie … who falls in love with Claire. Who may or may not be falling in love with him. This picture in the newspaper, it seemed to me, perfectly encapsulated the complexity of my characters’ situation. All the markers of romantic Paris – the French restaurant awning, the folded newspaper (Le Monde), the European car in the background and baroquely detailed (if blurry) streetlight in the foreground, a smattering of fat pigeons, even the man’s black turtleneck and the woman’s plaid skirt and sensible heels – contribute to the illicit thrill of this image. Does the man on the other side of the bench have any idea that his girlfriend/wife is being unfaithful? Did she and the man kissing her hand plan to meet at this place, or was it happenstance? For that matter, do they know each other, or is this a spontaneous moment of anonymous passion? Did the photographer happen on this scene, or was he, perhaps, hired by the man with his back to us on the bench? The image is shocking in its seeming casualness, in the brazen, in-broad-daylight transgression taking place before our eyes. I was fascinated by the contradictions: the woman so clearly part of a couple, yet making herself available to the man behind her, her demure pose contrasting with her open, searching palm. The man’s body language, too, is contradictory; he sits casually reading the paper, one leg crossed over the other, but his eyes are closed in passion as he kisses the woman’s palm. Instinctively I knew that this image would help me access the core motivations of my characters, who act in comparably indiscreet and scandalous ways. Claire loves her husband, but she feels something entirely different for Charlie – a passion she’s never felt. Charlie respects Ben, but is blinded by his love for Claire. And when Claire’s best friend from childhood, Alison, comes to visit and ends up engaged to Charlie, things spin even further out of control. 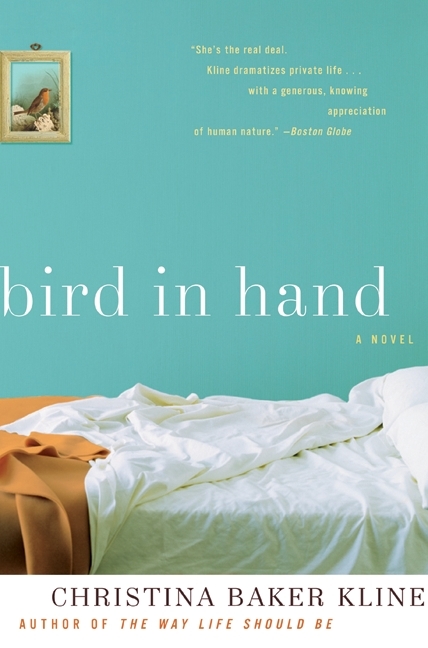 This novel, now in bookstores, is called Bird in Hand. When I sent the final manuscript to my publisher about six months ago I took the faded newspaper clipping down and put it in a cardboard box, along with my handwritten first draft of the novel. Now my bulletin board is covered with postcards from the New York tenement museum depicting the interior of an immigrant Irish family’s cramped apartment, a black and white photograph of a young couple at Coney Island in the 1920s, a map of the village of Kinvara, Ireland, and other inspiration for my new novel-in-progress. This essay, in a slightly different form – and with a larger version of the newspaper clipping – originally appeared in In This Light. Recently I was invited to do a guest blog for Madam Mayo, using a simple format: I had to provide five links that are in some way relevant to my new novel. (Other writers have used this format in all kinds of ways – 5 Secrets of Mexico City, Top 5 Aviation Museums, 5 Magnetic Spaces – as you can see.) Rooting around for ideas, I opened a file I kept while working on Bird in Hand. As I leafed through this file I could trace the genesis of my ideas. So I chose some passages that shaped my novel-in-progress – and why. That post is here. From left to right: Rosalind Reisner (co-moderator), C.M. Mayo, Julie Metz, Eva Hoffman, Christina Baker Kline, Roxana Robinson, and Miriam Tuliao (co-moderator). This month I was privileged to be on the Women’s National Book Association panel in celebration of National Reading Group Month. On her lively blog, “A Reader’s Place,” Rosalind Reisner gives the full report. She talks about my new novel, Bird in Hand, as well as recent works by Roxana Robinson (Cost), Eva Hoffman (Apassionata), Julie Metz (Perfection), and C.M. Mayo (The Last Prince of the Mexican Empire). It was an honor to be in a room full of people who are passionate about books; as much as I enjoyed talking about my own novel, I was even happier to listen to the other writers talk about their work. And here’s what Marian Schembari has to say about this extraordinary evening over at Marian Librarian. See my website for more about my novel, or purchase now. Available in paperback in June!